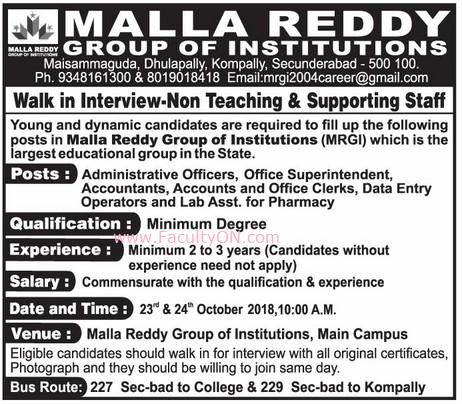 Malla Reddy Group of Institutions, Kompally has advertised in the EENADU newspaper for the recruitment of various non-teaching faculty jobs vacancies. Interested and eligible job aspirants are requested to walk-in on 23rd and 24th October 2018. Check out further more details below. College Profile: Malla Reddy Engineering College for Women is established in 2008, Accredited by NBA &NAAC with ‘A’ Grade, Permanently Affiliated to JNTUH, Approved by AICTE, certified by ISO 9001:2015 and has a strong vision of offering world class training to the promising engineers. Minimum Degree. 2-3 years experience is required. Candidates without experience need NOT to apply. How to Apply: Interested and eligible candidates are requested to attend the Walk-in interview by bringing their CV along with originals & copies of certificates / mark sheets / experience certificates and recent PP size photographs to the following walk-in address.